Are you falling back into the regular routine yet? Me either! LOL! My son isn't back in school yet - and my husband has had some time off.. so while the guys are home I guess I'm going to stray! Lots of your favorite challenges are BACK! Including Fusion Card Challenge! They're celebrating their birthday so we've got lots of guest designers this time! Check our the challenge this time! 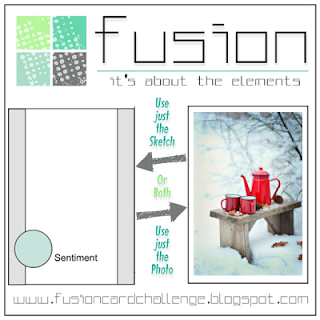 It's FUSION so you can work with the inspiration photo OR the sketch.. and if you're feeling clever just FUSE them together! The photo is dreamy.. perfect for a winter day.. I love all the contrast on this one.. hot drinks in a snowy setting, the pop of red against the white background. I tried to mix the sketch and the photo together. From the photo I grabbed the wood grain background, tree branches and pop of red. I even snuck in a coffee cup! The stamps are from Pretty Pink Posh Christmas Friends set. The Trim Tree die cut is from Poppystamps. I thought a pretty bow and another cardinal would add some balance and color to the design. I added a Pretty Pink Posh Stitched Scallop Border along each side of the center panel. I like adding a little bit of solid paper to break up patterns. The girlie on the card is feeding the birds. If you look close you'll see a sprinkle of micro beads adhered along the bottom of the card. I hope you'll stop by Fusion Card Challenge and see what the rest of the team made. Remember it's our birthday so we have some very special guests joining us too! I think you'll love seeing all the different visions of this challenge! Pattern Paper | Pebbles Everyday 6"
JEanne!!! How fun is it that I get to play cards with you at Fusion, too!!! LOve, love, love your card!!! Oh my goodness, the tree? so beautiful, delicate, and perfect for the photo/sketch/fusion you've got going here! 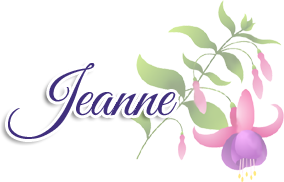 Your card is a delight, Jeanne! So very cute and such a gorgeous scene! Lovelovelove the scene you created in red and white! Beautifully done! This is adorable!! 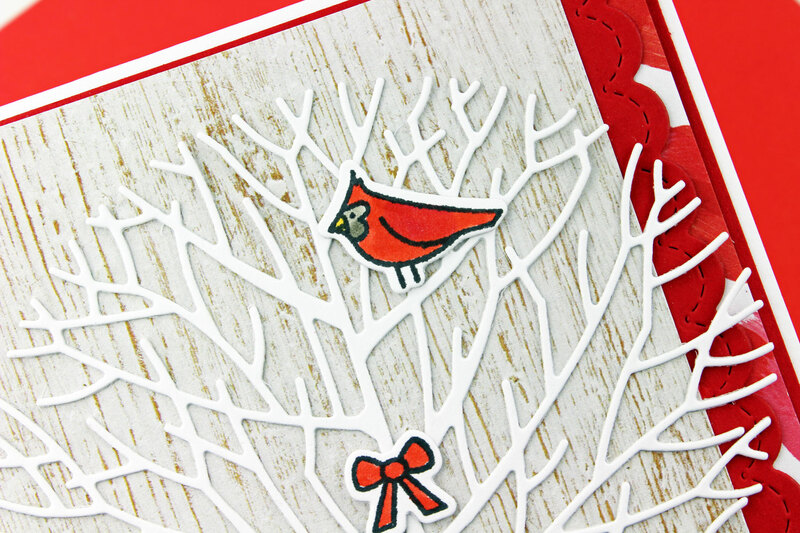 I love the fun border on the sides of the card and that you used the little cardinals. GREAT take on the challenge!! This card is absolutely darling Jeanne! I love every little thing about it! Oh Jeanne, I love this! I adore your interpretation of the challenge - with the little girl feeding the cute little cardinals! Gorgeous! What an adorable card, Jeanne, I LOVE this! Wow, Jeanne, I love how fabulous that bright pop of red looks! The contrast is so fresh and clean! This is one of my very favorites from you! Oh....this is just as sweet as can be. I love your adorable little lady all decked out for a cold day bird feeding. Love all that red! LOVE this so much! Having her out feeding the birds is a genius idea, SO adorable! That's one of my favorite winter activities! Fabulous colours and card Jeanne - just PERFECT for the 3rd Anniversary fun @ FUSION! When I left my full time career job my husband started calling me his "kept wife". The name of my blog is a play on that expression, because now I capture moments in photographs, and create in color in my "kept life". I hope you enjoy - thanks for stopping by! Pretty Little Studio - But First Coffee! Tupelo Designs LLC January 2017 Haul! 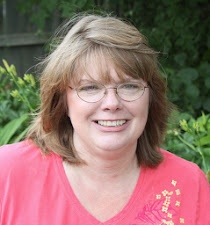 Tupelo Designs - Let's Chat! Mojo Monday #480 - I Woof You! 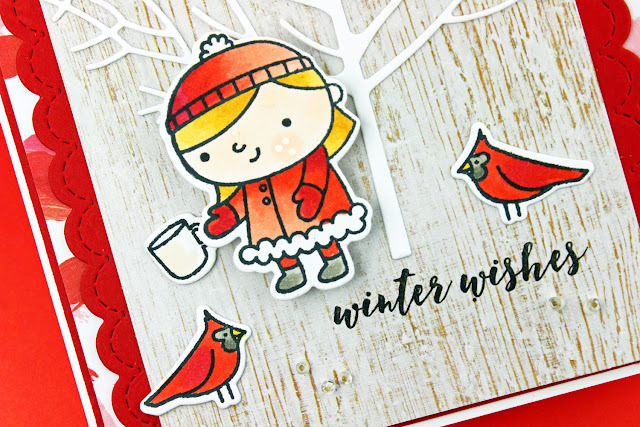 Make A Wish Faeries - Poppystamps giveaway! Pretty Little Studio - You Are The Best! Reverse Confetti January Release Blog Hop! RCSFYTT - Just Brew It! This blog does not accept any type of cash advertising. I do accept free product to use on my designs, however I will only endorse and recommend products or services that I like and use. If you like my projects I hope you'll use my affiliate links. Using these links doesn't change the cost of your purchase and helps support your favorite designers by providing them a small commission (usually 2-3%). You can click any link to jump to a store and purchase your favorite items. I appreciate your support! Please note that in commenting you do so with the knowledge that your user name and comment are visible to all who visit this blog and thereby consent to the use of that personal information for that specific purpose only. I do not collect this information stored on my blog. If you have left a comment and prefer that it not be seen, please delete it. Followers: If you follow my blog (Thank you!) you do so in the knowledge that my follower list is open to anyone who visits my blog. Your photo, name and links will appear and can be seen by anyone. If you don't want this data shared, please remove your name from my followers list.